Architecture is still a male-dominated field. But even as the gender inequality debate rages, women architects continue to make inroads in their profession. Like Julia Morgan and Marion Mahony Griffith – pioneers of the late 1800s and early 1900s – today’s women architects are distinguishing themselves by boldly stepping into the limelight with their creative designs and innovations. Take Zoka Zola, a Croatian-born architect, who is considered “one of the most influential architects of the new generation.” She has a Master of Architecture degree from the University of Zagreb and a Master of Arts in the Humanities from the University of Chicago-Division of the Humanities. After working for architectural firms in Rome, Vienna, and London, Zola opened her own firm in London. While there, she designed several public buildings and restaurants and served as a senior lecturer at Oxford. In 1995, she received the “Young Architect of the Year Award” in the United Kingdom. Then in 1997, Zola and her husband, Peter Pfanner, moved to Chicago so that he could head up Motorola’s cell phone design studio. She worked as an adjunct professor at the School of the Art Institute of Chicago, joined a local architectural firm, and started her own studio in 2002 – after she finished building Pfanner House. Zoka Sola on her architecure philosophy, including a discussion of Pfanner House, her home and studio in Chicago. At minute 2:23, a view of the exterior facade of Pfanner House shows differently sized windows that give a glimpse into the home’s interior. Other photos in video include: Brick houses, including Pfanner House, are predominant on this Chicago street; intriguing exterior façade with the street-level window attracts passersby, who can actually engage in conversations with people inside the house – from the smaller window; in back, Pfanner House has another huge window. Pfanner House is Zoka Zola’s first American project. She started building it the first year she and her husband moved to the U.S. It took five years to complete and was immediately a sensation in her neighborhood, within the industry and across the country. In 2003, Pfanner House won Architecture Magazine’s Home of the Year Award as the best house in North America. It was also included in Kenneth Frampton’s American Masterworks - Houses of the 20th and 21st centuries. Pfanner House illustrates Zola’s belief in open spaces, a connection to nature by linking the interior with the exterior environment. Located in Ukrainian Village on the west side of Chicago, the orange brick Pfanner House blends in with its neighborhood, but also stands out for its minimalist modern style and the many windows that adorn its simple exterior façade. There’s a large street-level window, another one above it, and other smaller windows around the house. Through the windows, passersby can see back walls and trees in the side yard. The floor plan was designed so that its balconies, terraces, and windows open the interior of the house to the street. As Zola describes it: “The house explores an architectural concept of Opening. Not an opening that merely extends the space … instead, an opening of one space to another space.” And throughout the house, there are views of space opening into space in a smooth and unhindered way. Walk inside Pfanner House and you see five levels of open spaces connected by stairs (in a technically two-story home). Zola’s studio sits in a room below street level amid all the large windows. Peter Pfanner’s study is on the second level floor plan. And on the official second story is the family’s private living space. There are three bedrooms, two bathrooms, and the laundry room. Pfanner House is constructed on a fairly narrow lot, even by Chicago’s zoning standards – just 18 feet wide. But there are 3,000 square feet of living space efficiently and elegantly built within five levels of open floor design – connected by stairs. It’s an expert and imaginative way of creating a sophisticated narrow lot home plan. Near its completion, Pfanner House began attracting the curious and the interested – among them another couple in Ukrainian Village – J.W. Glass and Laura Bedolla. Glass, a programming consultant and Bedolla, who works at a trading firm, were looking to build their dream home. They wanted a small, modern urban house plan that was energy efficient. Other specifications included a passive solar design to get as much sun during the winter and plenty of shade in the summer; geothermal wells for summer cooling and heating during the winter. Zola accepted the challenge and in addition, she recommended insulated concrete walls which hold heat very well, reduce cold drafts, and protect against harsh weather conditions. The Glass-Bedolla House, is a single-family home located about three miles from the Chicago Loop. It is a three-story structure with a basement, family room, open terrace, multi-use room, and enough space in the floor plan for potential expansion. Because Glass and Bedolla are avid gardeners, Zola included three gardens (one on the roof) in her design. Zoka Zola talking about her views on architecture as well as her works, including the Glass-Bedolla House, Walk through the garden into the main building and from the garden to the kitchen. The three-story Glass-Bedolla House features a main garden, east garden and a roof garden. Ivy and moss line the walls and cover the roofs to provide a natural cooling effect. What a wonderful dining terrace! Surrounded by large windows and a view of the garden. The “Zero-Energy” house uses energy generated on the site. To accomplish this, Zola’s studio installed an “auroturbine, a wind-electric generator that works well with the variable direction and turbulent winds of Chicago” and photovoltaic (PV) panels. “The photovoltaic process converts solar energy directly into electricity” does not emit harmful gases, and its operation is virtually silent. Along with the auroturbine and PV panels, a geothermal system and solar heat panels were installed to heat and cool the house. In addition to the energy-efficient systems, Zola put in large windows that provide great outdoor views. There are gardens with tall trees that give shade during the summer months; and greenery cover the building’s roofs. Pfanner House and the Glass-Bedolla “Zero Energy” home firmly established Zoka Zola as one of the top women architects not only in the U.S. but in the world. She has designed other zero-energy homes in Chicago and Kuala Lumpur, a solar tower (also in Chicago), and an affordable housing building in Croatia. A video of some of Zoka Zola's works from around the world. While Zoka Zola is designing zero-energy home plans, Cory Buckner is restoring modernist style homes built in Los Angeles by A. Quincy Jones and Whitney R. Smith, two important figures in mid-century modern architecture and planning. Buckner, who has a Fine Arts degree from Chouinard Art Institute in Los Angeles and a Masters in Architecture from UCLA, also specializes in contemporary residential and office design. In this video, Cory Buckner discusses the new approach to architecture and planning that A. Quincy Jones took. Example include the cooperative community of Crestwood Hills. Buckner has achieved success with her restoration and preservation of modernist-style homes in the Los Angeles Area. In 1993, a brush fire in Malibu destroyed the home Buckner and her husband, Nick Roberts, designed for their family. Their search for a new home took them to Crestwood Hills, a neighborhood in the Santa Monica Mountains, that still had original modernist-style homes constructed in the late 1940s. Buckner was familiar with the area since she had been hired to remodel two of these “originals” that were part of the former Mutual Housing Association, a cooperative community formed in 1946 by four musicians who had just returned from the war. The men pooled their resources and bought 800 acres of land in the area, divided into 350 lots and hired a design team to build the home plans. The team consisted of architects A. Quincy Jones, Whitney R. Smith, and structural engineer Edgardo Contini. The Brody House in Los Angeles (1948-1951) is another Jones creation. Check out the exposed beams and the greenery flanking the main entryway. Eventually 150 house plans were built including the MHA’s office. In 1961, 45 of the houses were burned in the Bel Air fire and the majority were torn down by new owners who had different tastes and needs, and most likely, were unaware of the historical significance of these homes. Buckner and Roberts loved the modernist-style homes in Crestwood Hills with their exposed wood beams, large windows, open spaces, their indoor-outdoor relationship, and the sense of community in the neighborhood. The home they purchased was an original A. Quincy Jones design and was first used as the office of the MHS and as the arts and crafts center, before being converted into a residence. In 1994, Buckner and Roberts renovation their new home – installing modern furishings and fixtures, landscaping, and building a studio below the house. They retained the outward sloping glass walls with their corresponding structural supports inside. Three of the wood supports were restored after a previous owner removed them to make room in the floor plan for an oversized dining table. The remodeled front entry of Buckner’s home retained the exposed wood materials and the glass windows. More glass windows in the living room provide a beautiful view of the hills. The home’s ground-floor kitchen comes with an island, plenty of storage space, and huge windows that allow abundant light into the space. The ground-floor office also works as a study/library. What’s not to love about this bedroom on the ground level? Great views and lots of natural light through the floor-to-ceiling glass windows. Enjoy more scenic views from the ground-floor deck. Want peace and quiet? There’s the studio below the house where Buckner and Roberts can always escape to. When renovations to their home were completed, Buckner headed a campaign to preserve the remaining 30 homes that were part of the Mutual Housing Association. But her efforts to create a historic preservation zone did not get enough support from the neighborhood community. Undaunted, she decided to seek preservation status for individual houses. When she appeared before the City of Los Angeles’s Cultural Heritage Commission to have five houses recognized as historic monuments, she brought Elaine Sewell Jones (Quincy Jones’ widow) and a few other influential friends. She received approval for four of the houses. Since then, Buckner has been successful in getting 11 more houses approved. In addition to their primary residence in Crestwood Hills, Buckner and Roberts designed a weekend vacation house plan in the Malibu Canyon. The 700-square foot house has a Great Room - kitchen, dining, living areas – and a loft space serves as the bedroom. Two sliding doors in the living room open up to the magnificent vista of the Malibu hillside. We celebrate Zoka Zola and Cory Buckner, two of today’s amazing women architects. 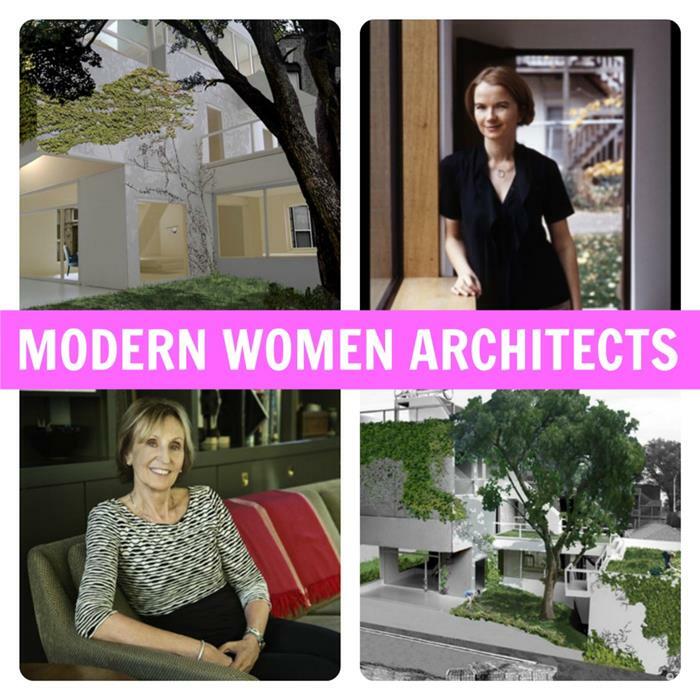 May their leadership, designs and stylistic choices inspire the future generation of women in architecture!